Recently our time for blogging has been limited. There was huge interest in our stand at the ploughing championships. It’s only now we are finally getting through these enquiries and therefore getting back to our day to day duties. I would like to thank everyone that came to visit our stand during the ploughing championships. Over the coming weeks we hope to contact you all. And look forward to talking with you and answering any questions that you may have as a result of seeing our stand. 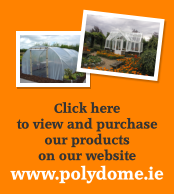 As always you can find lots of answers to questions already on your mind at www.polydome.ie and please feel free to contact us directly at our office.